There are so many opportunities each week to practice and enjoy your dancing at Elegant Dancing. We have a large hardwood floating floor that your feet and knees will love! 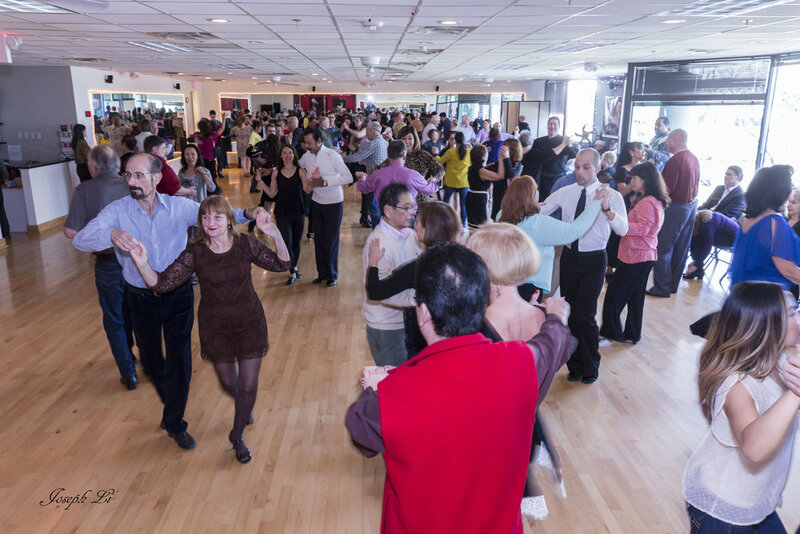 Our music is always upbeat, including ballroom & Latin standards, top 40 and golden oldies. Come meet old friends and make new ones! A great crowd and a happy vibe! Upbeat music & always fun! Michele's parties are always a favorite at Elegant Dancing. As a long-time teacher and party DJ, Michele knows how to show you a real fun time! Always the most upbeat music and a fantastic vibe! Generally held on the 3rd Saturday of each month (check Events Page for dates). Sunny and PJ have been holding popular International Dance Parties at various venues for many years. Now at Elegant Dancing twice a month, Sunny invites all dancers whether raw or experienced, International or American Style, to enjoy her parties. A beginner friendly dance party, Perfect for the newer student who wants to practice in a stress-free, supervised environment. Staff will be on hand to trouble-shoot when you get stuck. Beginner dance lesson at 1:30. All dancers welcome! See Events Page or Calendar Page for monthly dates of the Tea Dance.